Recreation Services student workers checking out the trails at the new Cross Country Ski and Snowshoe Center at Drumlins. 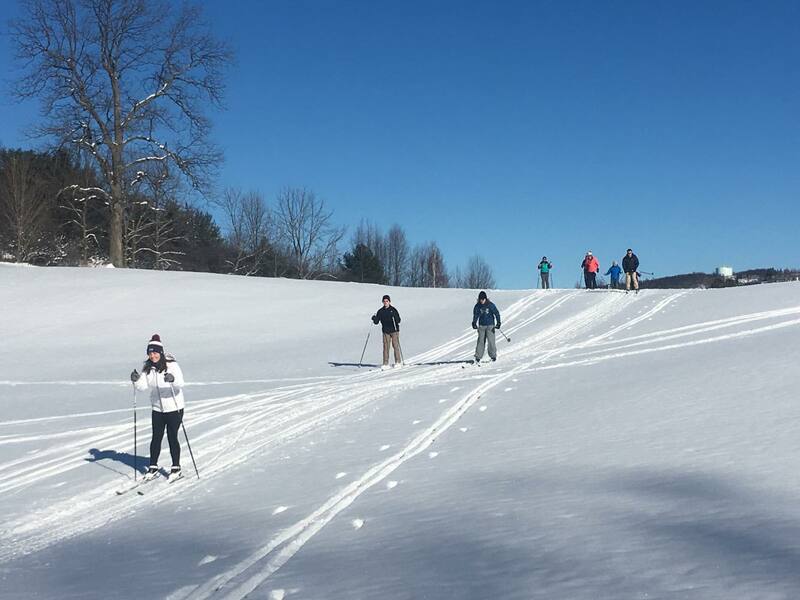 Beginning this weekend, students will have an exciting way to enjoy the winter weather—the Division of Enrollment and the Student Experience has announced the opening of the Cross Country Ski and Snowshoe Center located at Drumlins. The new center, created in part through funding from the Invest Syracuse initiative to enhance the student experience, furthers efforts to expand options for students to stay healthy and well. With financial support from Auxiliary Services and design work by Campus Planning, Design and Construction—both within the Division of Business, Finance and Administrative Services—a space near the golf shop at Drumlins is being renovated to house the new center. Recreation Services and Drumlins staff have converted the public side of the golf course at Drumlins to a system of groomed trails, which are now open. Trails are marked and mapped, with three trails to serve beginner, intermediate and advanced skiers. The center also includes access to equipment such as cross-country skis, poles, boots and snowshoes. Access to the trails and equipment is free for all with a valid SU/ESF I.D. Guest passes are available for $5 on the Recreation Services website. Recreation Services student employees had the chance to test out the trails and complete training in various areas such as proper equipment usage, trail etiquette, ski technique and safety, as well as facility operations. The Cross Country Ski and Snowshoe Center at Drumlins is open Friday, Saturday and Sunday from 10 a.m. to 5 p.m. The season will run from Jan. 18-March 31 (weather permitting). Transportation to Drumlins is available through Centro Bus 340/340C from College Place. With the opening of the new center, Recreation Services is also hosting two moonlight snowshoe hikes: Thursday, Jan. 24, and Tuesday, Feb. 19. The hike includes transportation, snowshoes and a trail guide. Pre-registration is required at least two days before the scheduled hike by emailing Julie DeLeo. For more information or questions, contact Recreation Services at 315.443.4386.